This is one of Kate's Faves! Enjoy Sweet Sheets for $31.96 (regularly $39.95) until April 25th. Keep your linens and fabrics feeling so fresh and so clean with a calming blend of lavender, lemon and bergamot. 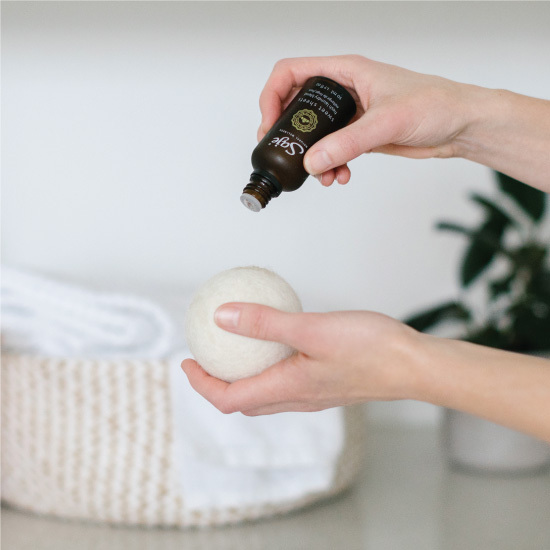 Add 5-10 drops of the laundry blend to each saje dryer ball before beginning each drying cycle (lasts approximately 5 loads), or add 15-25 drops to your unscented detergent before beginning your wash cycle. A citrusy uplifter helps relieve stressful feelings and promotes relaxation. Freshen up your laundry and sheets by adding 5-10 drops to our wool dryer balls before beginning your drying cycle. The blend will last up to approximately 5 loads of laundry before it’s time to reapply. This essential oil blend is 100% natural, vegan, plant-based and contains no toxins, synthetics, fragrances, parabens or dyes. Add 15-25 drops to your unscented detergent before beginning your wash cycle to leave your clothes smelling that much fresher, naturally. I will buy it again! It is a light and fresh scent. I add it to my unscented laundry detergent and to the saje dryer balls and my laundry smells fresh and clean.